I'm really not a seamstress. That's not one of my strong suits. (And as you can see I'm not a photographer either!) However, every once in awhile, I get the urge to sit down and sew. Because I know where my weaknesses lie, I usually choose projects that are not too complicated. Straight lines and a little bit of pressing, I can do that. 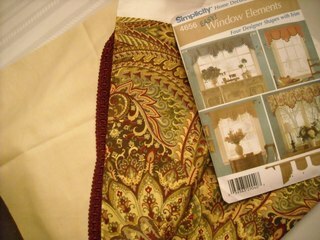 This was one of my latest projects—a valance for my family room doors. 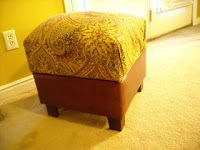 And then with some of the leftover material I recovered an ottoman top that was torn. I chose a colorful fabric that matched my room (I love color) and just a cream lining. I didn't want it to compete with the color in the valance. Then I pulled a color from the fabric for the trim.